We are engaged in formulating, supplying, distributing and exporting a wide range of Calcium Preparations. Our range consists of Calcium Carbonate & Vitamin D3 Tablet, CICAL MZ Tablet, Calcium Carbonate & Alfacalcidol Tablet and Calcitriol & Calcium Carbonate Tablet. All our medicines are widely acclaimed by the clients for their accurate composition, longer shelf life and effectiveness. Apart from this, our expert quality controllers stringently check all the products on various parameters to ensure flawlessness. 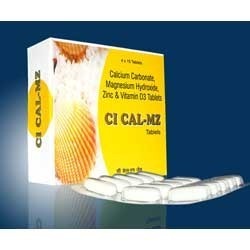 CELCAL PLUS Tab is combination of Calcium citrate, Vitamin D3 & many minerals. 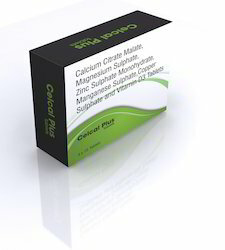 Calcium citrate in CELCAL PLUS Tab is able to decrease the bone resorption(i.e breaking of bone & releasing bone fluid calcium to blood) significantly more than calcium carbonate in postmenopausal women. This combination medication is used to prevent or treat low blood calcium levels in people who do not get enough calcium from their diets. It may be used to treat conditions caused by low calcium levels such as bone loss (osteoporosis), weak bones (osteomalacia/rickets). CELCAL PLUS Tab also contains copper which helps in maintaining bone density & zinc is responsible for bone growth. 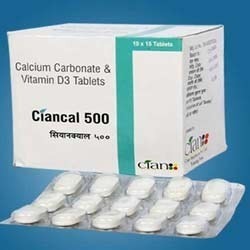 We are engaged in providing our customers with Calcium Carbonate & Vitamin D3 Tablet. To assure about the zero impurity, we check all the products on different parameters laid down by the industry. Furthermore, we provide customized packaging facility to clients as per the the specifications given by them. Our clients can avail from us CICAL MZ Tablet that are widely appreciated by the customers for their accurate composition, effectiveness and longer shelf life. We formulate all the medicines using premium ingredients that are obtained from the reliable and certified vendors of the market. Furthermore, we have a team of expert quality controllers, which checks all the products on various parameters to assure zero impurity. Composition: CaCO 1000mg eq. to El. Calcium 400mg + Mg(OH) 240mg 3 2 eq. to El. Mg 100mg + Zinc Sulphate Monohydrate eq. to El. Zinc 4mg + Vit. D3 250 I.U. Looking for Calcium Preparations ?